Modular Data Center Market size is set to exceed USD 50 billion by 2025; according to a new research report by Global Market Insights, Inc. Increased cost-effectiveness with the adoption of prefabricated technologies in business operations is a major factor propelling the modular data center market growth. The major cost benefits offered by IT facilities are in the deployment, installation, operations, and maintenance costs. These advantages allow small-scale businesses to easily deploy and maintain their business operations with reduced capital expenditure. The large facilities incorporate modern technologies that require high operational expenses & maintenance services. Business sectors are spending large amounts of money on installing preventative maintenance solutions to predict component failures or downtime. However, modular facilities being portable in size and design do not require such costly tools to manage the system components and devices, propelling the modular data center market demand. The rising demand for edge computing in business operations will augment modular data center market share. The businesses are dependent on IT infrastructure that is cost-effective and close to the network source, providing better data transmission speed & accuracy. Edge computing differs from traditional data centers as they bring processing power from the center of the network to the edge, closer to where the data is consumed by a computer, smartphone, or other device by deploying smaller & decentralized servers. Prefabricated facilities are offering several features such as ease in deployment, unique design & architecture, and portability. These modular data centers are being installed at remote locations/sites to address the latency and bandwidth issues by linking to regional data centers whenever needed and improving the user experience. Such factors are driving the adoption of edge computing, fueling the modular data center market size. Businesses operating in the IT & telecom sector require the speedy deployment of data centers. The modular facilities are fully integrated with network connections, servers, power lines, monitoring units, fire detection units, security, storage, and cooling. The customers are not required to buy these additional hardware components separately and appoint an in-house technical team to install and manage them. In the modular data center market, IT & telecom industry is witnessing a high adoption of the facility to improve the scalability and flexibility of its business operations. With the rapid business expansion or relocation of a business base, the enterprises are dependent on the IT equipment that can be easily shifted or deployed to a new location, accelerating the market growth. In 2018, solutions accounted for over 80% of the modular data center market revenue. With the increased demand for energy-efficient operations, several manufactures are incorporating advanced technologies into the power & cooling devices. For instance, Schneider Electric SE is offering optimized cooling solutions specifically designed for prefabricated SmartShelter modules and containers. Moreover, with the rapid expansion of business operations, the IT facility size is also increasing simultaneously for supporting the data management tasks, driving the demand for modern IT solutions. 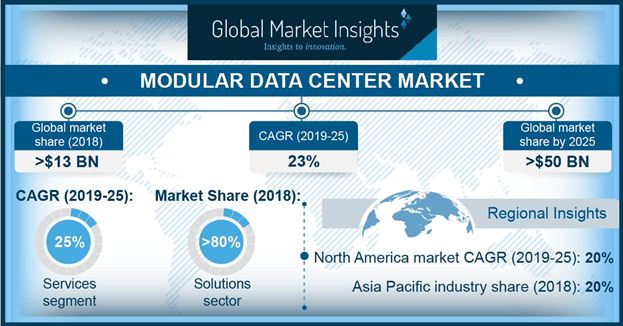 Increasing demand for data storage & applications from enterprises will drive the demand for solutions in the modular data center market over the forecast timeline. The North America modular data center market is witnessing high growth and will expand at a CAGR of 20% over the coming years. The region is one of the earliest adopters of the technology owing to the region’s stable economic conditions and developed infrastructure. The growing use of internet services and connected devices has led to a rise in the demand for modular data centers in the region. In the U.S., an increased adoption of these facilities for military & defense applications has also been witnessed. The U.S. Army is implementing modular data centers in other countries. In February 2019, the U.S. Air Force announced its plans to install a prefabricated facility at British Royal Air Force's Lakenheath base in the UK. Moreover, the awareness of green data centers that support green initiatives coupled with government regulations pertaining to power efficiency is expected to aid the market growth. Standards, such as ANSI, are imposing strict regulations for the construction & operation of green data centers. Major companies participating in the market include Cisco Systems, Inc., IBM Corporation, Baselayer Technology, LLC, Huawei Technologies Co., Ltd., Hewlett-Packard Enterprise Company, Dell, Inc., Schneider Electric SE, SGI Corporation, IO Data Centers, LLC, BladeRoom Group Ltd., Vertiv Co., Cannon Technologies Ltd., Eaton Corporation, Flexenclosure AB, CommScope, Inc., Rittal GmbH & Co. KG., and Stulz GmbH, among others. These players are engaged in partnerships to develop innovative technologies that will improve business operations and IT performance. For instance, in June 2016, Stulz GmbH announced its partnership with Technology Space Integration (TSI) for developing a modular data center kit. This partnership will allow the company to offer a complete solution the modular data center market for prefabricated facilities in from high-performance computing to telecom racks & cabinets with the integration of STULZ cooling technology.